8 Ball Pokie Revew - Play today! The player will find in 8 Ball Slots a game that is a classic, a 3 reel slot machine that offers a single payline to place a bet on, but in return does give away huge prizes, as long as you manage to place a large wager on it. The game is not that great to look at, a typical classic design with graphics that don’t impress at all and with symbols that look pretty much the same, except for the number written on them. The game doesn’t have any features of its own, offering a top payout of 2000 coins, or up to $200,000. 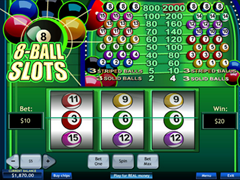 The theme of the slot is the game of pool, so you will find that every single symbol used here is a ball with a number of it. The 8 Ball is the highest paying symbol, followed by the rest of the balls, which have numbers from 1 to 15 on them. The player typically needs for a combo of three identical symbols to appear on the one line of the game, but there are situations where you can get paid simply for having three solid color balls or three that are striped. The game uses the green of the felt as a major part of the design, used in the background image and everywhere where there is an empty space. You will find that the reels don’t take much of the screen, so another big chunk is occupied by the paytable and the game logo. There isn’t anything special about this slot machine, as you will find out by yourself. It has way too many symbols when you consider that there is only one payline, so the odds of getting paid consistently are not that great. The game doesn’t really have any special features or effects to consider, it’s a simple game and a classic in every way. Winning a prize here requires the presence of three identical symbols on the line, or a combo of three solid or three striped balls. The game uses either 1 or 2 coins, so you will find that the payouts vary accordingly. For most of the symbols the payout simply doubles when there is an extra coin used, but for the top jackpot you get a bit of a bonus. Instead of doubling from 800 to 1600, the top combo symbol will award 2000 coins for 2 coins used in the bet. You’d have to be both a fan of pool and of classic slots to be able to enjoy this, as the game doesn’t look that great and it doesn’t have any features inside.